Regional variations of barbecue are defined by cooking style, the type of wood used for smoking and cuts (and kinds) of meat. But the real way to tell barbecue apart is the sauce. Eastern North Carolina is the home of vinegar-based sauces, while western N.C. has more tomato paste in it. South Carolina is the land of mustard-based sauces. Kansas City's sauces are tomato-based but generally sweeter than Texas sauce, where the stuff is a bit spicier. Alabama stands alone for its mayo-based white sauce. 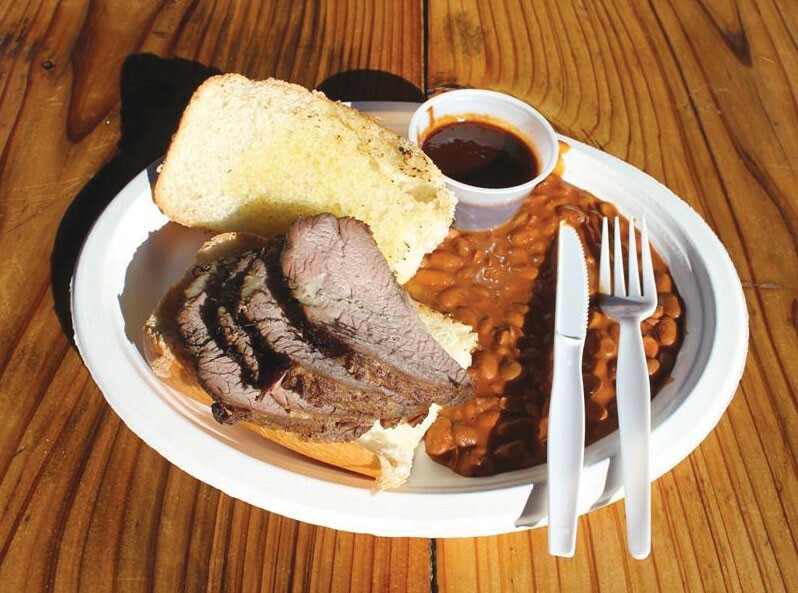 So what to make of the spicy sauce at Buster's Barbecue in Calistoga? Buster's is a perennial Bohemian Best Of winner. I confess I'd never been, but driving through town at lunchtime recently, the smell of smoking meat wafting through the car window put my vehicle on autopilot and next thing I knew I was turning left into the parking lot. I ordered the spicy sauce with my combo order of pulled pork and tri-tip. The meats were smoky and juicy, but it was the sauce that was most memorable. It reminded me of a good chile colorado, spicy, rich and perfectly emulsified. It's tomato-based, with a touch of brown sugar and garlic, and more than a little heat from dried habañero chiles. But somehow the sauce is more than the sum of its ingredients. Owner Charles "Buster" Davis comes from a family of cooks in Louisiana, a state that's more of a crossroads when it comes to barbecue and doesn't have a readily identifiable style. He says his sauce is just a spicy barbecue sauce. No secret ingredients. I'm not sure I believe him. I'll be coming back to conduct more research. Buster's Barbecue & Bakery. 11207 Foothill Blvd., Calistoga. 707.942.5605.